Note: Full brother to champion filly Ashado was second in an allowance then 7th in the Holy Bull in the slop for his stakes debut. 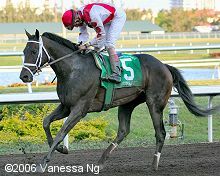 Came back to win an allowance and then ran 3rd in the Florida Derby. Missed the Derby due to lack of graded earnings, but won the Peter Pan Stakes at Belmont on Preakness day.